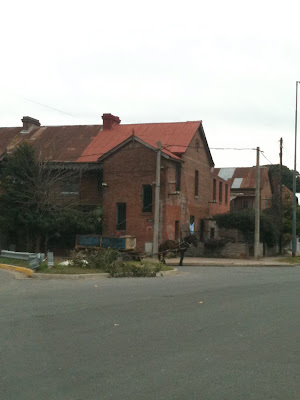 Once upon a time, the English came to Rosario to build and operate a railroad. And while they were at it, they built a tiny village within 2 oddly shaped blocks. Strangely, I didn't even notice it until recently - it's next to Shopping Alto and and Parque Scalabrini Ortiz. I'm not telling you this because I want you to go there, though - it's not a tourist attraction. It's referred to as Barrio Ingles - Batten Cottage (or what's left of it). It seems like an ironic cross between a Disney village and a ghetto. La Capital did a short article on it 2 years ago, when it was around 120 years old. From what I can tell, Peron nationalized the railways in 1948 so the Brits have been gone for a while. It seems that it's now controlled (or not) by a federal agency - ONABE - which is something like a department of public assets, among other things. According to the article, some residents are paying 120 pesos a month to become eventual owners. Who knows how long that takes, or how someone gets in on that deal. But it's obvious that some residents sincerely care about the upkeep and preservation of their 'houses' and others are likely on government support. One neighbor admits that Batten Cottage lacks unity among residents and others complain about the lack of municipal support. Clearly, community block associations aren't a thing in Argentina. But the fact that it's under the auspices of the Argentine government pretty much explains what's going on here. Yeah, that's a horse pulling a garbage cart - belonging to the people who dumpster dive. So whether you're looking for a place to park your garbage horse or a picket fence, Wee Britain has it all!